If you are looking for an exceptional luxury holiday destination this Easter, look no further than one of these top luxury villas in Cape Town – and more specifically, Camps Bay. 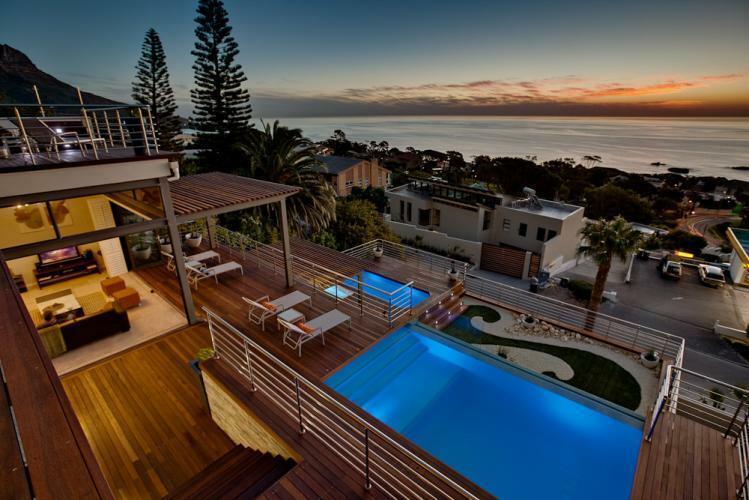 The suburb of Camps Bay and the surrounding coastline is synonymous with wealth, exclusivity and leisure, and this beautiful stretch of the Cape Peninsula coast is bursting at the seams with luxury villas, beach houses and apartments that beckon the rich (and often famous) from around the world. Let’s take a look at five of the top luxury villas in Camps Bay and what makes them so special and so desirable over the coming months, when Cape Town experiences its best beach weather! 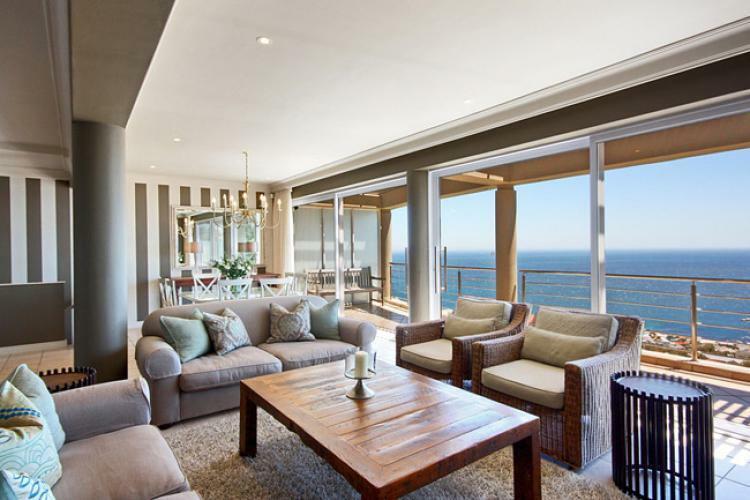 With 6 bedrooms, 6 bathrooms, superb décor and huge west and sea-facing windows, Apostle’s Edge earns it’s place in our list of Top Luxury Villas in Camps Bay. Typical of the finest luxury one would expect, it a good example of the kind of sophistication on offer in South African holiday rentals. When it comes to this level of tourism offerings, Cape Town is as cosmopolitan and first-world as cities come – and this is reflected in the plush décor and amenities typified by villas like Apostle’s Edge. To add to the appeal of this three-story villa, it is located at the end of a private cul-de-sac high above Camps Bay, offering full privacy and security and it features a huge entertainment area, deck and sparkling pool. Another 6 bedroom and 6 bathroom villa is the enticingly named Serenity. 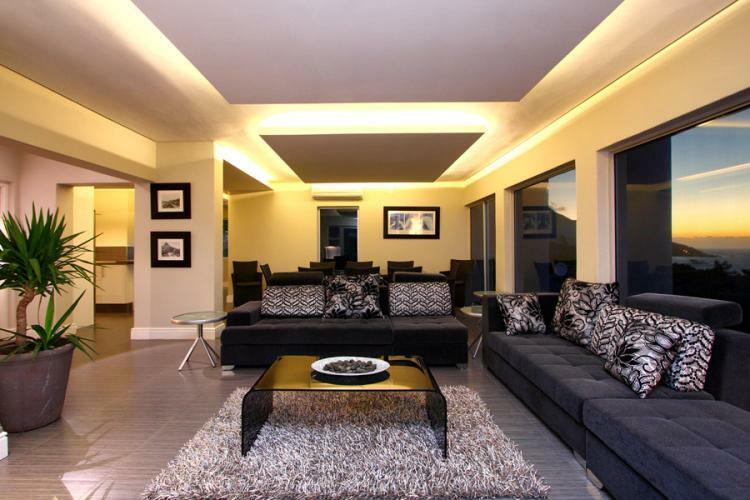 This property is a cut-above the rest and superbly fitted, which is why its no surprise that it’s on our list of Top Luxury Villas in Camps Bay. Once again, décor sets this property apart. 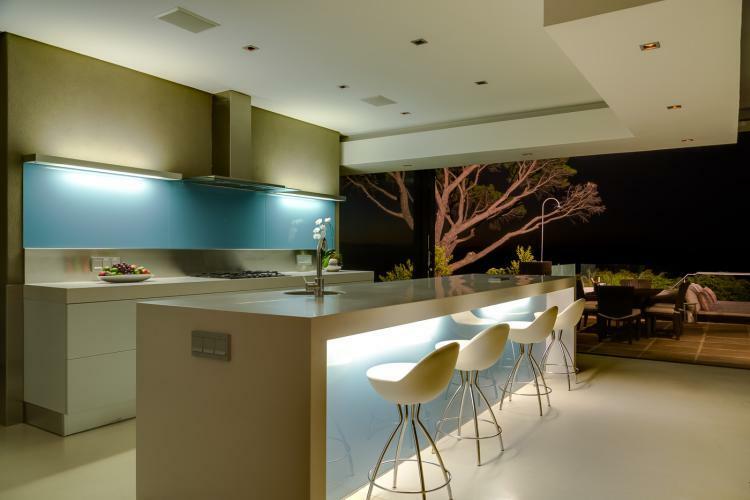 Described as a mix of ‘urban sophistication with beach house style’ Serenity’s interior is all about clean, crisp lines that maximise space, views and the use of a calming but upbeat palette of colours. Serenity has been designed to take your breath away before encouraging you to breathe deep and forget the outside world, and if you want to take relaxing to another level, staff and management provide on-site and concierge service – making this Camps Bay holiday rental a private hotel. The name says it all: La Maison Hermes offers designer luxury along with a butler service in a stunningly and somewhat cheekily appointed villa that makes no secret of the ‘discerning guest’s appreciation for ‘what’s in a name’. To add some tongue-in-cheek to the wink, the 6 en-suite bedrooms are themed according to iconic desirable locations and the ‘big names’ of Chanel and Madiba. This beautifully decorated villa offers a playful and delightfully light blend of world traveller taste with down-home Capetonian style and typically beach house amenities – including a deck and pool with loungers where you won’t need to lift a finger except to raise your butler-prepared cocktail to your lips. Sea and Rock Villa is next up on our list of Top Luxury villas, offering holiday accommodation for up to 14 people in warm and tasteful luxury. 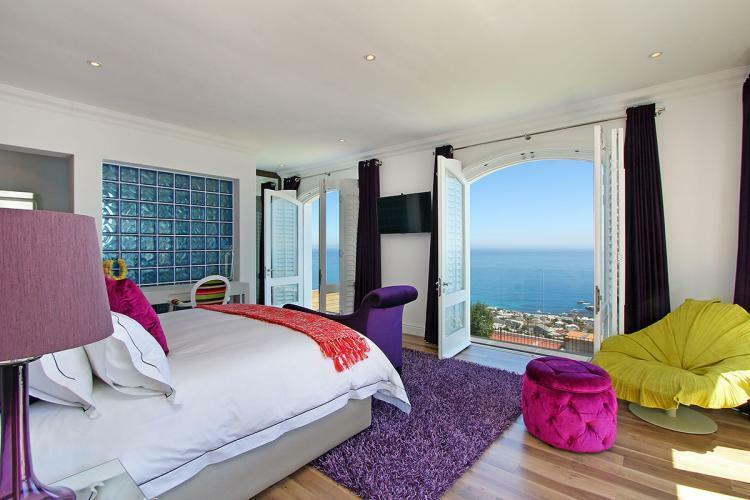 This grand villa has been designed and decorated to celebrate what makes Camps Bay so very special – its location tucked between the mountains and the ocean. Situated over 3 levels, the villa is built using natural indigenous materials and features a Jacuzzi, plunge pool and rim-flow pool, a ‘Zen garden’ and enough outdoor deck space for a monumental sunset cocktail gathering. All seven bedrooms have direct access to the balconies and decks – and it’s barely worth a mention at this point that the views are ‘to-die-for’. 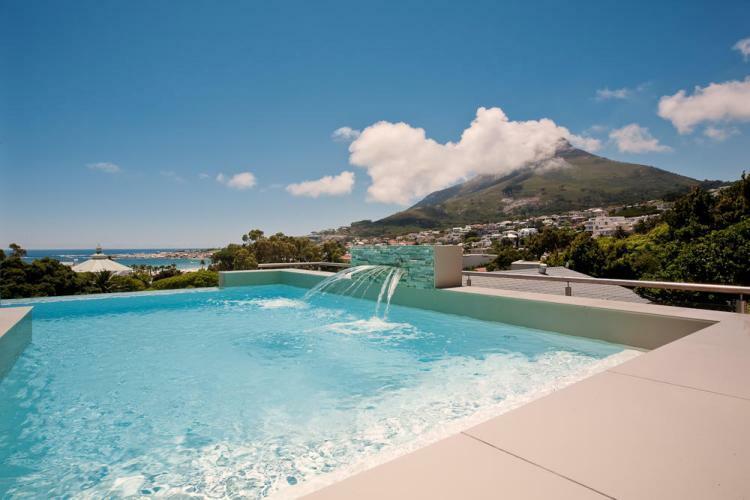 Swimming pools are fairly essential accoutrements to consider when choosing which if the top luxury villas in Camps Bay to go for, and most offer at least one – some more than one. It all depends on your needs. However one thing they all have in common is incredible views. If you can see yourself spending your Easter holiday evenings soaking up an ocean sunset in a swimming pool, cocktail or glass of champagne in hand, Camps Bay is your ideal destination. The pool at 43 Central Drive won’t disappoint. The enticing water compliments an equally enticing and exclusive designer interior in a villa built to maximise its perfect location. The views are panoramic and unforgettable…whether from the comfort of the couch or the cool of the pool.